Yep, the wait is almost over, we're opening on Monday (12/9/13). Thanks for waiting so paitiently, I hope everyone enjoys. I'm going to post here to tell you about all the wonderful things we have planned follwoing the release of the Bukkit 1.7.2 development build. I posted a little snippet on our facebook page (https://www.facebook.com/KiteCraft5" target="_blank" rel="nofollow">http://https://www.facebook.com/KiteCraft5) of the events I plan to work on. So far first priorty is obviously spawn itself. We are going to go with a re-work of the KC2 spawn. My thinking behind going with a re-work of that spawn is that it's sort of like going back to our roots. We're on our 5th variation of KiteCraft and I feel like sometimes things get lost in translation so to speak. I bet all of you don't know where we get our server name from, do you? Well, once upon a time KiteCraft wasn't run by me (Linux) it was run by a guy named Kevin. Well Kevin has a last name, which is Kite. Ever since he named the server after himself it stuck. 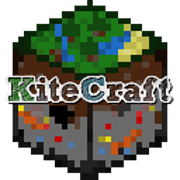 KiteCraft as been trough many verations, staff have changed, and so have owners. Just because all of those things changed, though, I'd like to get back to that original KC. The one where people weren't even in the mood to play Minecraft, but loved the community so much, they just came on to chat. I had someone just the other day message me and tell me that Kite has been the best server they have ever played on. It just gives me the warm fuzzies. Anyway, back to the point of this post: To tell you what's going to be happening in the following months. Baronies & Barons: New land plots are going to be scouted and given to the old barons. Once locations for the old barons have been found, I will scout more locations to auction off. We will do it as before, if you have the winning bid, you win the land. If you have no clue what a barony is, I will be posting a section in the forums dedicated specifically for barony information. Ender Dragon & Wither Boss Fights: It's pretty self-explanatory. Basically, you'll get a choice of what you want to take into the arena, melee or ranged. You get a set amount of equipment/food/potions/ect. and you must kill the Dragon/Wither Boss with what you have. If you kill the Dragon, you will get the coveted Ender Dragon Egg and the XP Orbs the Dragon drops OR if you kill the Wither Boss you will get a Wither Skull and the XP Orbs. Donor Benefits: Currently there are no special permissons or extra content for people who donate to the server. I will be working on setting up a donor group with a few special permissions, a green "$" sign in front of their name, and possibly access to the old KC2 map. It may not sound fancy now, but it will be. I want donors to know they are slightly more special because they are really helping me out when the donate. Even $1.00 helps. I have to pay monthly for this server to run, and it gets expensive ($15 a month) and tiring. Community Events: I'd like to start doing more events. I already listed the Boss Fights, but I'd like to have more. I don't know if any of you remember the KC Olympics, but that was pretty fun. I'd really like to have another. I was also thinking of a Christmas party, a New Year's celebration, ect. We will also be building minigame areas for games like Spleef, and horse racing.